Two days after coming from behind to win the SuperTour Finals women’s championship with a grinding hill climb victory, 26-year-old Liz Stephen of East Montpelier, Vt. ran away with Wednesday’s U.S. Cross Country women’s 30-kilometer mass start classic title. Seventh-year U.S. Nordic Ski Team racer Stephen, out of Vermont’s Burke Mountain Academy, captured her seventh national title with a 63-second win over two-time world sprint queen Kikkan Randall, 30, of Alaska Pacific University. Randall, a 17-time national champion who won last year’s 30k mass start freestyle national title at Craftsbury, Vt., was denied a national championship this year. This year’s national titlists, all 26 and under, wre Sadie Bjornsen (twice), Rosie Brennan, Jennie Bender and Stephen. In third place out of 36 finishers on the warm, beautiful day at Royal Gorge, Ca. was Alaska Pacific’s Brennan. On Monday in brutally cold and windy conditions at Sugar Bowl’s 8,000-foot Mount Disney, the 5-2, 100-pound Stephen had used her hill climbing abilities to crush the 6k freestyle hill climb course and wrest a near-certain SuperTour Finals title away from favored Randall. Wednesday’s weather was quite different—sunny weather and 55-degree temperatures that caused slush and slow racing conditions. Still, Stephen led all three laps and broke away during the final circuit to win in 1.41:54, over a minute ahead of Randall (1.42:57). Sun Valley’s Nicole DeYong had a terrific race placing sixth overall in 1.46:05, less than five minutes back and two seconds behind 2013 world team sprint gold medalist Jessie Diggins, 21, from Minnesota and Stratton Mountain Academy. Diggins has won five national titles, four coming in 2012. DeYong’s race season includes the SuperTour women’s victory Feb. 10 in the 21k Owl Creek Chase at Aspen, Colo.
Sun Valley Ski Education Foundation Nordic Gold Team head coach Colin Rodgers said, “It was a serious battle through the slush—very impressive for Nicole. She battled for fourth place the entire race. And she bested World Cup skiers Maria Graefnings from Sweden (1.46:07, 7th) and eighth-place Sadie Bjornsen from Alaska Pacific (1.46:11, 8th). 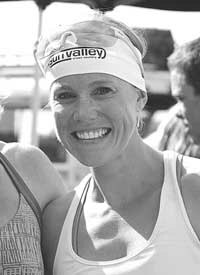 Chelsea Holmes of Sun Valley, third in Monday’s hill climb, placed 13th at the 30k classic distance in 1.47:02. Denver University’s Makayla Cappel of Hailey completed a fine SuperTour Finals/U.S. Nationals week in 19th in 1.47:44. Alexa Turzian was 25th in 1.50:59. Expected to compete in today’s U.S. Long Distance National 50k/20k mass start classic for men at Royal Gorge are Sun Valley’s Mike Sinnott, Patrick Johnson, Rodgers and Luke Costley in the shorter 20k junior race. Prize money for men’s and women’s U.S. National Championships per gender is $1,200 for first place, $600 for second and $300 for third place.